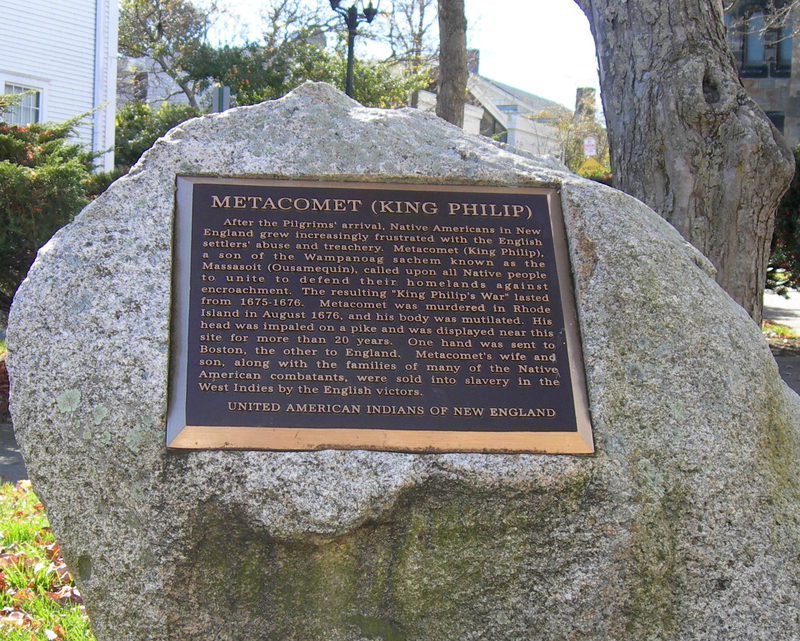 Metacomet Historic Marker; Plymouth, Massachusetts. Photo by Jimmy Emerson, DVM/Flickr (Noncommercial Use Permitted with Attribution/No Derivative Works). After the Pilgrims' arrival, Native Americans in new England grew increasingly frustrated with the English settlers' abuse and treachery. Metacomet (King Philip), a son of the Wampanoag sachem known as the Massasoit (Ousamequin), called upon all Native people to unite to defend their homelands against encroachment. The resulting "King Phillip's War" lasted from 1675 – 1676. Metacomet was murdered in Rhode Island in August 1676, and his body was mutilated. His head was impaled on a pike and was displayed near this site for more than 20 years. One hand was sent to Boston, the other to England. Metacomet's wife and son, along with the families of many of the Native American combatants, were sold into slavery in the West Indies by the English victors.